You can optimize your images for the web and make them load faster using Pixlr. The websites mentioned in this tutorial are Unsplash and Pixlr. If you develop sites for clients there’s a good chance those clients will be adding blog posts, with featured images, to their sites. Wouldn’t it be nice if you could have one simple set of instructions for all of your clients, without having to worry about which image editor they use. You can. Just recommend that they all use Pixlr. Pixlr is a free image editor that’s more than capable of resizing, cropping and compressing the photos you or your clients use on websites. Loading an image from a web page. Browse Unsplash and find an image that you like. Click the image, then click the image a second time. You must view the image at it’s full size! Right click and choose: Copy image address. Paste the image address you copied from Unsplash into the dialogue box. In the Pixlr file menu choose Image > Image Size. I’m making a large hero header image, so I chose 1920 pixels wide. I do not touch the height setting at this point. I’ll do that later using the crop tool. After I click OK my image is resized to 1920 pixels wide. In the top bar, I select Constraint: Aspect Ratio. I type 1920 for the width and 1080 for the height. I place the crop tool in the grey border that surrounds the photo. Then as I drag, the box is constrained to the correct proportions. When I click the left mouse button, the marque I’ve drawn changes into a crop box. At this point, you may want to try again. If you do, press the escape key on the top left of your keyboard. To crop the image press the enter key. I choose: File > Save. From the file menu. I type a name for my image. I choose JPEG for the file format. I choose 30 or 60 for the quality setting. Then I click the blue OK button and save my image to my desktop. If your clients already have a photo editor they prefer to use, that’s great. But for everybody else, Pixler is a good free tool that’s easy to use. How do I Login and Logout of WordPress? How do I change the Site Title and Tagline? How do I change the look or design of my WordPress website? How do I make Google friendly web page links? How do I make WordPress web pages and blog posts? How do I write a post without publishing it yet? How do I add a header image to my site? How do I add fancy featured images to my WordPress website? How do I make a navigation bar? How do I enable or disable comments on my website? How do I put content in the sidebar or footer of my website? How do I change the look of my blog listing pages? How do I add image galleries, sliders and forms to my site? How do I use the different post Format types? How do I organize my content using categories and tags? How do I edit my profile picture, add some biographical information and reset my password? How do I hide dialogue boxes I don’t need? 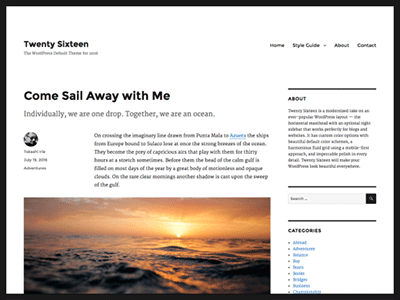 Download the free Twenty Sixteen theme. Please note, this site is paid for with money I earn through affiliate links. If you’re in the market for premium web hosting from a team you trust why not checkout StudioPress Sites. It’s designed to be Fast, Secure & Worry Free! This website is independently owned by an affiliate marketer of StudioPress. It is not sponsored by StudioPress, WP Engine, Copyblogger Media LLC, WordPress, or Automattic Inc. WordPress, Genesis, StudioPress and WP Engine, are registered trademarks of their respective owners.